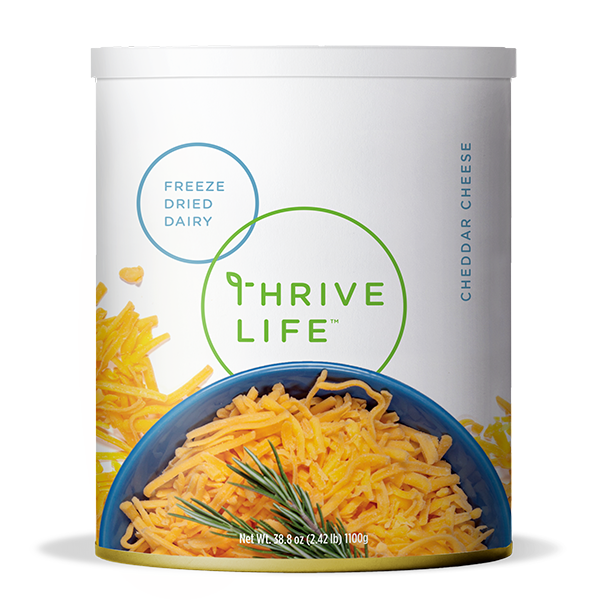 Thrive Shredded Cheddar Cheese will give your recipes a bold kick of flavor. Try using Thrive Shredded Cheddar Cheese in your classic grilled cheese sandwiches, festive quesadillas, or tasty soups. Its mild cheddar flavor will add the perfect flavor to make your dish a success. Drizzle 1/2 cup cold water over 2 cups cheese and stir continuously until water is incorporated. Store in fridge overnight or for several hours before use. Cultured Pasteurized Milk, Salt, Enzymes, Annatto Color, Potato Starch Added To Prevent Caking. Drizzle 3 ½ tbsp. of cold water over 1 cup of cheese and stir until well combined. Let sit and occasionally stir for 35 minutes or until cheese has softened. Use it in quesadillas, burritos, tacos, soups, dips, salads, pizza, breads-anything that could use some cheesy goodness! If you're melting cheese on top of a dish, make sure it's had at least an hour to reconstitute in the refrigerator so that it will be the right consistency for melting.